WUAHAHAHAHA, it’s just past midnight and I’ve finished the last of my ‘side business’ projects!! I am really exhausted, god, the things I do for money, I tell myself that this is the last ‘project’ I will take but I know if more forthcoming requests i.e. money is flung my way, I would do it in a heartbeat! Which means, I am a money face ($______$). But my family and friends already knew that right? Photos soon! Mark is landing in Perth in approximately an hour, woo hoo. Oh and even bigger news, I am going to Melbourne with the Rabbit this weekend, Foodie capital of Australia here I come (^_______^). Life is not much fun at the moment. It’s all about work and old jobs and new jobs. About finances and responsibilities. About a million billion annoying tasks everyday. It’s about rainy gloomy grey weather. It’s shivering at the bus stop every morning and crashing in bed exhausted every night. 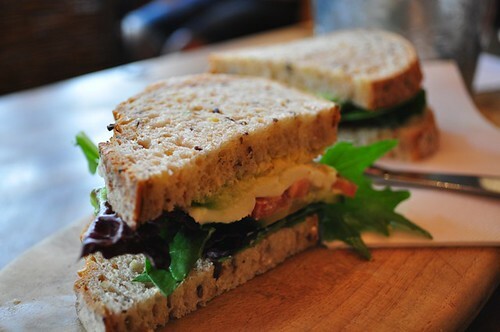 What happened to lazy Sunday brunches? And what about coffees that weren’t a daily necessity and an excuse to walk out of the office but weekend treats and big warm mugs of creamy, smooth, fragrant liquid? 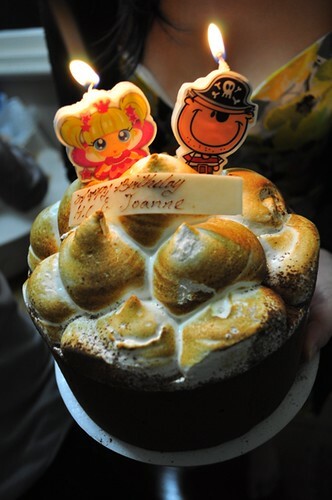 cute birthday cakes with matching candles for the matching couple? What happened to weekend gatherings, friendly dinners and homemade sangria cocktails? I’ve been so busy trying to catch up with work and life changes that I haven’t had time to indulge, blog, let alone have fun. No cooking in the kitchen, I haven’t tried a new recipe in weeks. Eating badly. No punishing yet relaxing yoga sessions. But I’m going to enjoy my weekends again starting this Saturday :). I hope. By demand (actually only one request, and that’s from my sister who went to Japan too -__-“) I bring you the 2nd Japan post! It was our 2nd day in Osaka but also our first ‘full’ day in the Land of the Rising Sun. Only it didn’t feel very sunny at all because despite being spring, it was pretty chilly in Japan. We stopped for a bit of breakfast before heading on our long train ride to the Himeiji Castle. Choco cro wasn’t planned (unlike a lot of our other meals, my sister is a great planner and fantastic foodie), the popular bakery chainstore just looked warm and inviting and already I was craving coffee. Turns out, their coffee wasn’t very good but their baked goods and croissants were yummy! 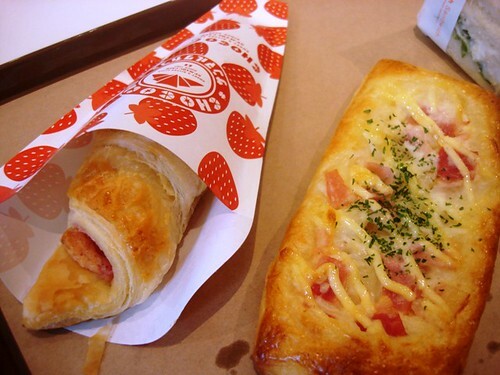 I had a strawberry croissant which was warm, sweet, flaky and crispy, very nice. I like Japanese pastries, especially Mister Donut (T___T) which is non-existent in Perth. The train journey to Himeiji castle was quite long but I didn’t feel it because I dozed along all the way. 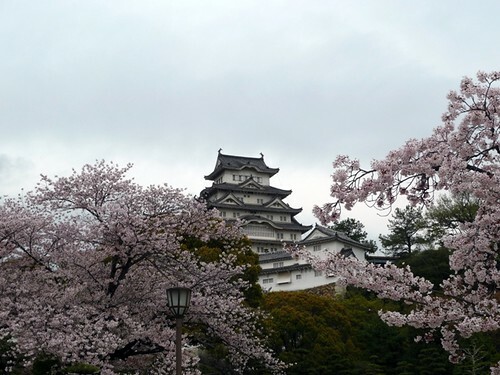 Throughout the ride we pointed out at sakura trees dotted throughout the neighbourhood, little did we know, those little trees would soon pale in comparison once we saw the sakuras at Himeiji castle. Did I mention that my sister named our travel itinerary (yes she made one up! very professional too, my mother was memorising it and referring to it every day like a travel bible, hilarious) the Sakura viewing trip? 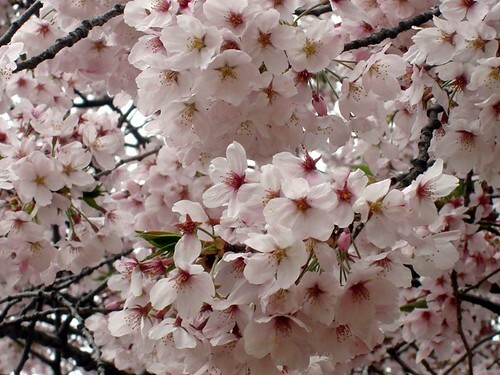 This Japan holiday was really about the sakuras. And how pretty they were at the Himeiji castle. Everywhere. Sakura petals floating in the air. Sakura petals all over the grass. Sakura trees waving gently in the breeze. Sing along with me ‘sakura .. sakura ..’ Hahahaha. Pink blossoms everywhere. Jo went into sakura fever immediately. Once we walked into the grounds of the Himeiji castle, she went ‘WAAAAAH’ and ran towards the trees and sat on the grass with sakuras surrounding her. I wish I could show you the video, but that’s how we all felt, or at least I felt. Like ‘waaaaaaaaaaaah’. 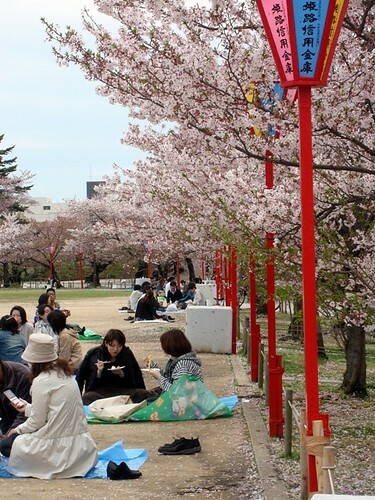 Japanese people were picnicking under the sakura trees, I think they call it ‘hanami, meaning flower viewing, what a nice spot to ‘flower view’ don’t you think? 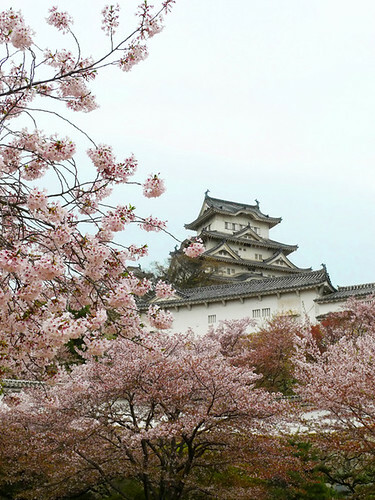 Himeiji castle was really very pretty, the castle itself creating a beautiful and majestic backdrop to the sakura trees. I think we took about a million pictures here. But I didn’t know then that we would take EVEN MORE pictures once we got to the sakura viewing at the Osaka mint. 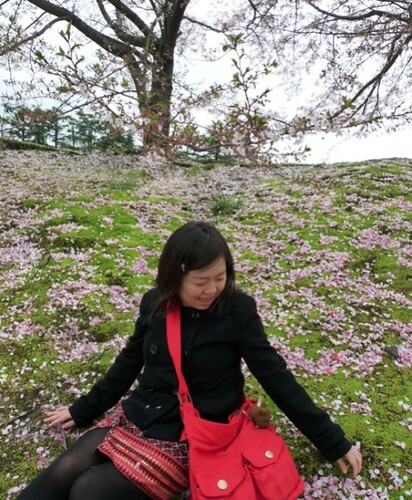 Maybe because the cherry blossoms season is so short (they only bloom for about 1 – 2 weeks), so pretty and so treasured by the Japanese people, we were totally swept up in the cherry blossom viewing and sakura fever. It was fantastic and so fun. After all the flowers it was time for food. It was late in the afternoon, we walked around the shopping centre not knowing what to choose or where to eat. 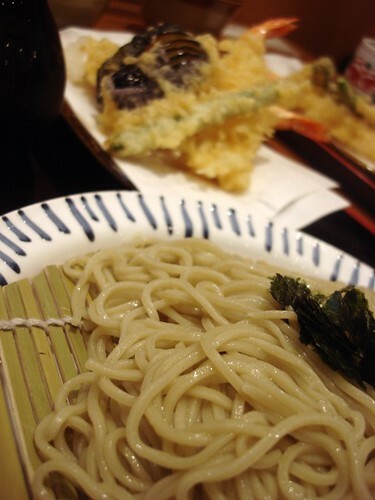 In the end we settled for soba, buckwheat noodles. While I’m not a noodle person, I really like soba a lot. 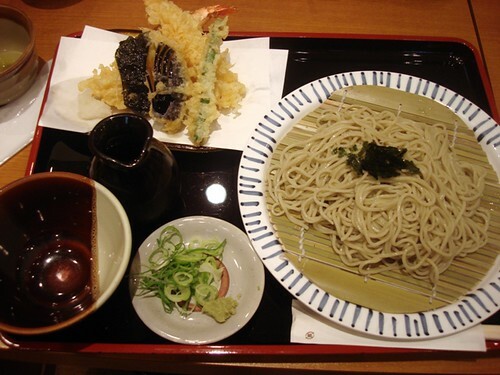 It just seems so simple and easy to eat, I especially love eating cold soba dipped in tsuyu sauce, light and tasty. Mine came in a set with tempura. It wasn’t outstanding, but still very nice. I finished my portion of soba easily. A lot of friends and colleagues who know that I’ve been to Japan ask me ‘are the portions very small?’ Maybe because Japanese food here is rather expensive and of smaller portions, everyone expects Japanese food to be of tiny portions. My answer to their question, have a look at Jo’s spring soba set! 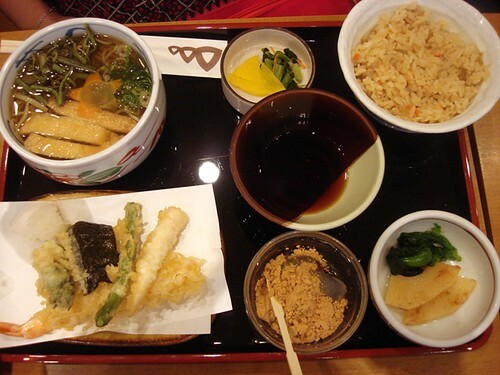 It had everything, soba noodles in soup, rice, pickles, tempura and dessert, a jelly of some sort. I can’t remember what we did after our late lunch. It’s possible that we went shopping which we did quite a bit (^___^). Sigh sigh Shinsaibashi ….. I miss shopping in Japan, I haven’t bought a thing since I’ve been back in Perth, somehow everything looks grey and drab, or maybe that’s just me. 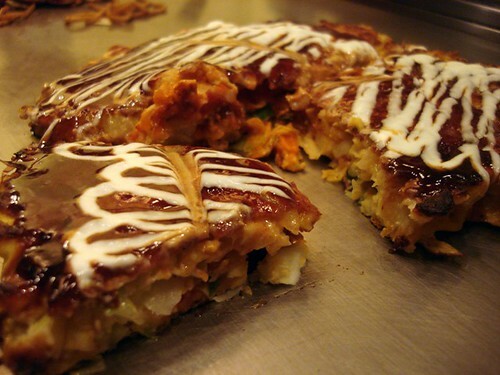 In Perth, we hardly see okonomiyaki on the menu, sometimes it’s there as a ‘starter’, a little Japanese pancake made of flour batter, cabbage etc. and includes condiments such as pork, or seafood, kimchi etc. 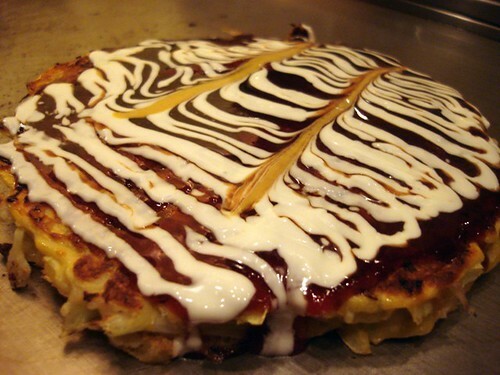 But okonomiyaki in Osaka is serious business, they have restaurants specialising in this grilled/panfried pancake, serving a variety of creative versions and styles. I remember we tried kimchi, prawn.. These ones came with noodles, called a modanyaki. Everything was really delicious. 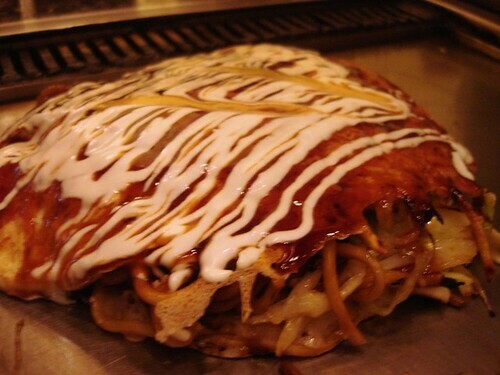 I love okonomiyaki topped with generous servings of okonomiyaki sauce and mayonaise. 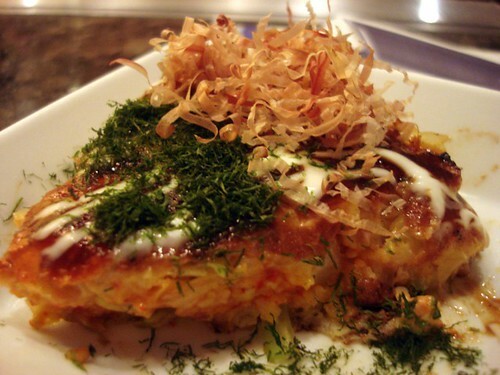 But okonomiyaki isn’t perfect until you add the all important toppings of aonori (seaweed flakes) and bonito flakes, then it’s perfect! 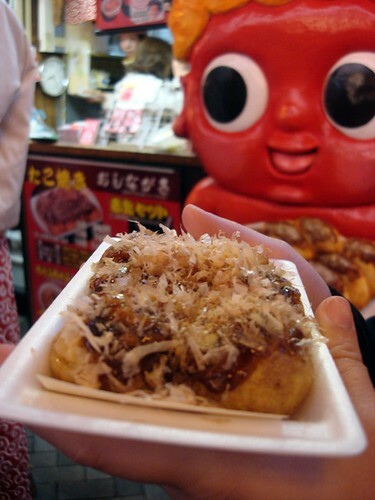 On the way back to the hotel, we tried another Osaka famous specialty, takoyaki (tako balls, octopus balls) at one of the popular red devil stalls. It wasn’t the best we had in Osaka, I’ll blog about that when we talk about the takoyaki musuem (quite paiseh and yet proud that we went to all these foodie musuems, hehe). That’s all you had? And you call yourself a foodie? I hear you ask. Of course we didn’t stop there. No night stroll or dinner around the Dotonbori area was complete without our final stops at our favourite combini stores, there was Family Mart which stocked Jan’s favourite coconut fruit jellies, and Lawsons which was conveniently located right opposite our hotel. 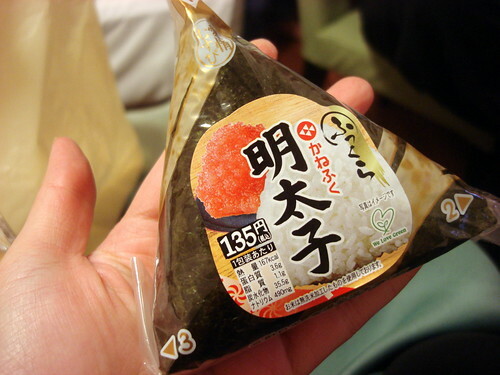 It was there that I bought my first onigiri and started my life long love affair with mentaiko. 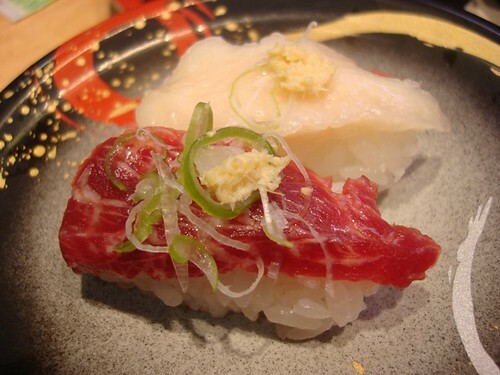 According to Wikipedia, mentaiko is marinated roe of pollock, meaning marinated fish roe/eggs. 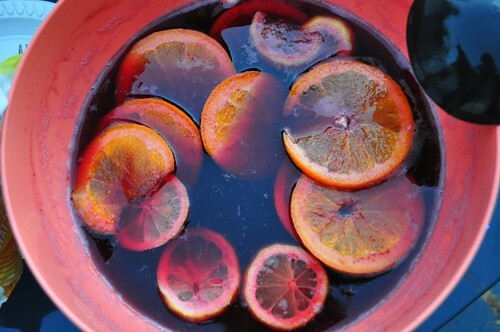 Sounds gross? You don’t know what you’re missing. It’s slightly spicy, salty and so so so tasty. 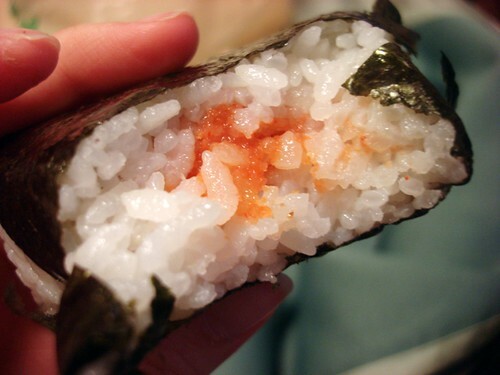 Wrapped up in a rice ball with seaweed, it is really really nice.. sigh. really nice. After that, Jan and I sort of went on a mentaiko everything hunt, we ate mentaiko snacks (remember those round rice cracker things Jan? So nice hor), mentaiko pasta, I didn’t bother buying any other types of onigiri except mentaiko onigiri. Come to think of it, I even bought one to eat on the flight home. My last mentaiko. (T____________T). 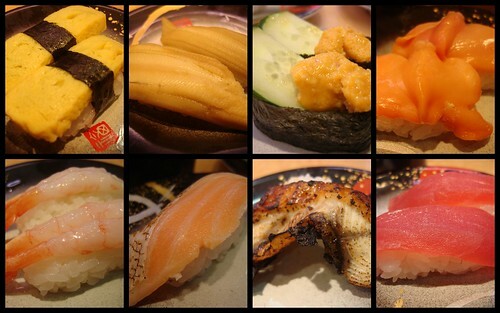 Ok lah, this blog is depressing, I miss sakuras, okonomiyakis and mentaiko already!! Time to sign out .. stay tuned for Day 3, I think we’re going to Kyoto for a philosopher’s walk and an unforgettable ‘smokin’ lunch, hahaha. I usually love this time of the year when leaves are starting to fall and the snap of the autumn chill is felt in the air. Soft rugs come out of their hiding places, warm leggings and long boots start making appearances on the Terrace. For some reason autumn this year feels very cold. I can’t believe it’s two weeks to the start of June and the winter season, but it must be winter because I’m scheduled to get my annual flu vacc tomorrow. 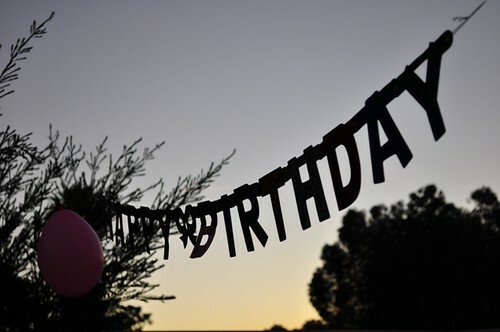 Has half a year already gone by? Yet so much has happened since then and I predict, much more to come. An interstate Foundation Day long weekend might be in the cards. I’m hoping and wishing for somewhere brand new with gorgeous coffee experiences and foodie delights. 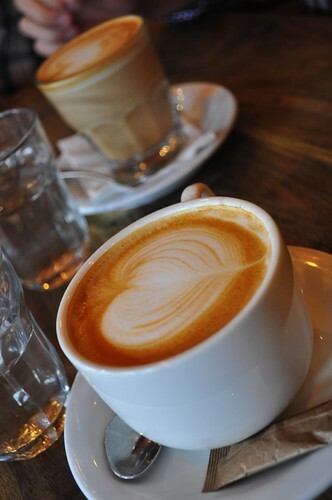 It’s time for my coffee fix before the daily grind begins. There’s a new coffee place inside Cloisters Terrace called Low Down which is very promising (Fiori beans), it’s not as delectable as Velvet coffees, but it’s pretty good. The charming, slightly scruffy down to earth baristas whom greet you by your name and dispense warm smiles while wishing you a good day at work help elevate the coffee experience tremendously (I have to admit, while the coffee’s excellent, Velvet’s service isn’t all that great). Business is buzzing. Sigh, the start of Monday and another hard week ahead. Already my mind is floating with images of soothing jooks (congee) and chicken herbal soups. 5 days and counting…. I’m just really really busy! It’s a crazy full on week at work . Doesn’t help that I’m running a ‘side’ business that requires working after hours every night. Life is really all about waking up, going to work, coming home from work, working from home, going to sleep, then going to work in the morning again. I’m getting a taste of life if I pursue further studies while working in the future, and it’s not very nice at all. At least my current business has cash benefits (^__^). But the big news is, I’m changing jobs! I’ve been offered a permanent position at a different organisation (really down the road from where I’m currently located) in an area that I’ve really wanted to work in since uni. I think it will be a fantastic career development so I’m very excited and happy. Our trip to Japan started from our transit point in Hongkong where Jo and I met up with my parents. My mum gave me a prettily wrapped present, guess what was inside? 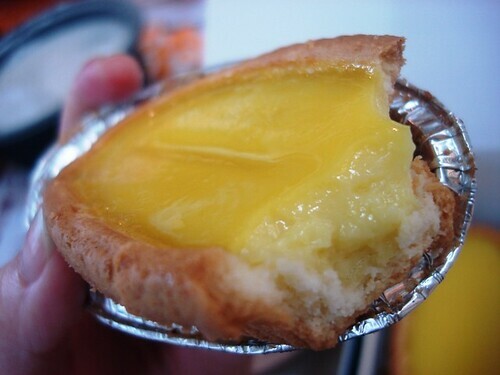 Yummy St.Honore bakery eggtarts which she bought from outside the terminal, yum yum yum, I love Hongkong eggtarts. The holiday was off to a good start. By the time we arrived in Osaka, it was late afternoon. We travelled by train to reach our hotel which was located in the famous entertainment district of Namba. I just read that Namba has Japan’s best food culture ‘Kuidaore’ meaning ‘eat till you drop’ , now I know why my foodie sis chose Namba as our hotel spot, excellent choice Jan! 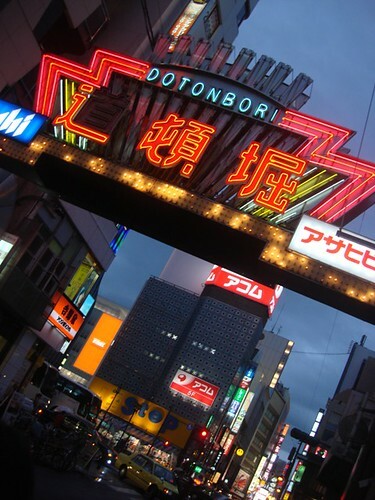 We were located on Dontonbori which is a fantastic area filled with eateries and lots of shopping. Sigh.. I miss Dotonbori and Shinsaibashi, our favourite shopping arcade in Osaka. 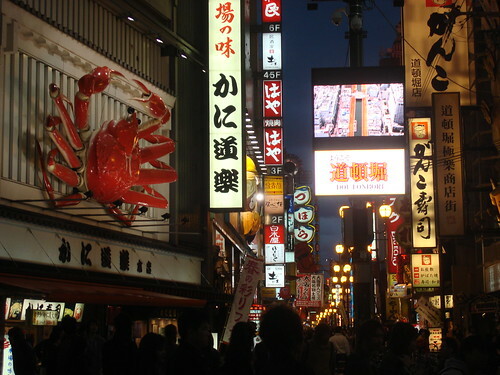 The giant moving crab billboard of the crab restaurant Kani Doraku is a famous landmark in Osaka. We actually had a crab meal at Kani Doraku a few days later but that’s a whole other post. The first night of walking the streets of Dotonbori was so exciting, there were lights everywhere, people, so many cute things to see and things to eat. We couldn’t stop snapping photos and pointing excitedly at everything and anything. 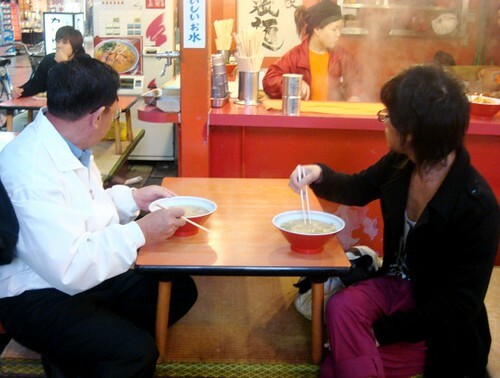 My father’s first meal in Japan was ramen of course. 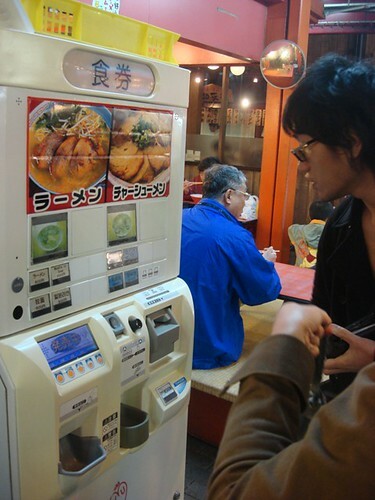 Both he and my brother in law bought their ramen via vending machine outside the stall, this is pretty common in Japan and very convenient too. It wasn’t the best ramen we had in Japan but better than anything to be had in Perth or England. My father was satisfied. The rest of us girls didn’t have ramen because we were hanging out for something even better. First meal in Japan? Sushi of course! And fantastic, fresh, 130 yen for all plates conveyor belt sushi too. 130 yen is around $1.50 AUD, I was expecting food in Japan to be expensive, so was pleasantly surprised at how cheap and affordable the sushi was. Best of all, it was so good, the quality of the sushi, the fish and seafood was fresh and wonderful, the range available was wide and plentiful, there were many things on display that I had never seen or tried before. 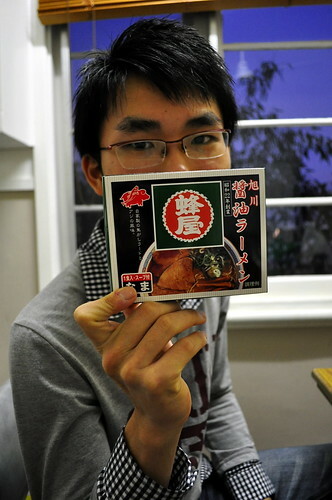 One of the highlights was raw horsemeat, my sister dared me to try it and I *gulp* did. It was interesting. But I wouldn’t try it again. It felt very raw, didn’t taste very strong of anything in particular but I kept thinking ‘I’m eating raw horse’, so it didn’t go down very well. I had to gulp lots of strong green tea after swallowing. 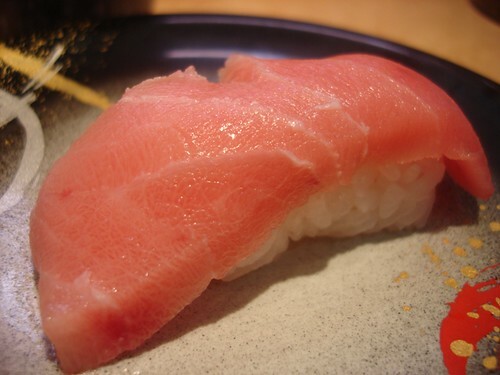 The maguro toro (tuna belly) was very very good, best tuna I’ve ever had, so fresh and just gorgeous. 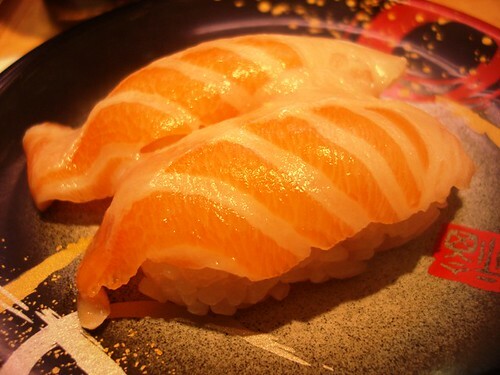 Usually if we have conveyor belt sushi in Singapore or Australia, we look out for raw salmon sushis most of all. But in this shop, we didn’t even bother with the normal salmon sushis but only ate salmon toro (salmon belly) instead, why settle for average salmon cuts when you can have delicious, melt in the mouth salmon belly instead? Best of all, everything was only 130 yen! Oiishi sushi of such gorgeous quality that was amazingly affordable and so fun to eat (I love conveyor belt sushi, what to pick, what to pick..), what a great way to start our holiday in Japan. The only other person I know who might love ramen more than my father is Richard. And I stress on the word ‘might’. Because my father is a huge huge ramen fan, seriously, I think he would have happily eaten ramen for every meal during our Japan holiday. Myself, I’m not a huge ramen fan, I usually prefer rice over noodles. 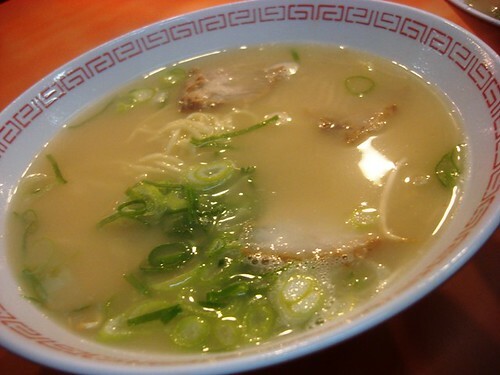 But ramen in Japan, is really something special. My sister brought our whole family to the Shinyokohama Ramen Musuem located in Yokohama for some serious ramen eating. I’ll blog about the musuem in a separate post, it was a long trek away but definitely worth it, I would do it again in a heartbeat. So if this is not about the musuem, what am I blogging about? Well Richard didn’t make it on the trip, while we were downing bowls and bowls of luscious ramen, I couldn’t help thinking ‘ gosh, he would love this’. So the next best thing I could do (besides eating lots of ramen on his behalf, wuahaha) was … buy him a box of instant ramen from the musuem’s souvenir shop! 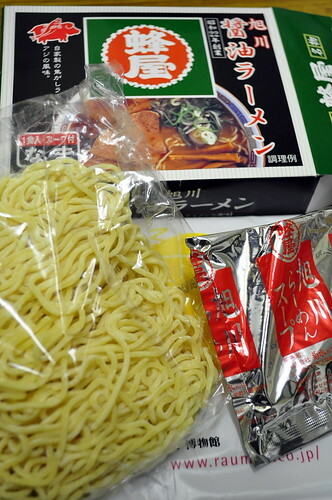 These boxes of ramen are only sold in the museum and include ramen from the famous ramen shops featured in the musuem. I didn’t know which shop to choose from, but ended up choosing this shoyu based ramen because my sister and brother in law highly recommended it, my brother in law liked the ramen from that shop best during their last visit to the musuem (sadly the shop was no longer in the musuem when we visited). I bought a slab of pork belly and braised it tonight just for the ramen. 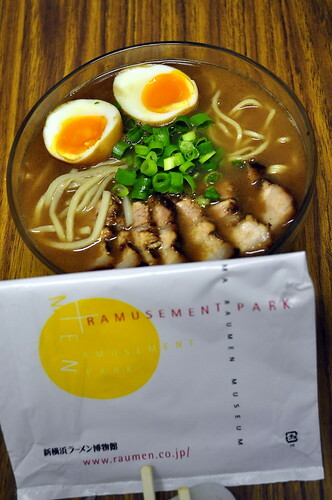 Just one bowl, all the way from Japan, would it be anything close to the ramen heaven I had in Japan? I highly doubted it. I was pleasantly surprised when I discovered that the packet containing the broth essence wasn’t in powder form but liquid. A wonderful aroma emerged when we emptied it into our pot of boiling water. Ta-dah! 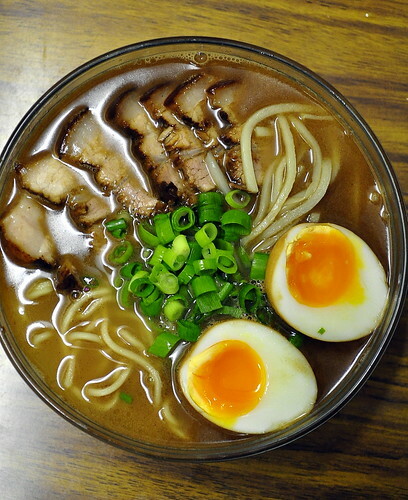 Ramen and shoyu based broth with thin slices of braised pork belly, strips of crunchy bamboo shoots, spring onion and half boiled egg, the essential condiments in a bowl of ramen. Verdict from the ramen lover? ‘We need to eat more’. ‘Very good’. ‘I give it 8 out of 10’. 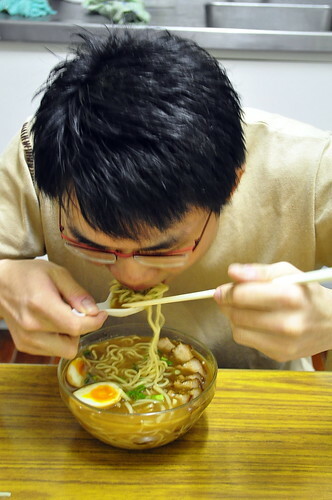 He found the texture of the ramen springy and smooth. Fantastic combination with the broth which was flavourful, tasty and gorgeous with the fragrance of the spring onions, crunchy texture of the bamboo and creamy egg. My verdict? So much better than I expected, comparable or perhaps better than my favourite ramen shop in Perth, but in comparison with the real thing in Japan? Of course not as good, but still, really not bad at all. I was impressed. My only regret? I should have bought more!!!!!!!!!!!!!! !